Shipwrecked! VBS2018 has truly been a blessing. 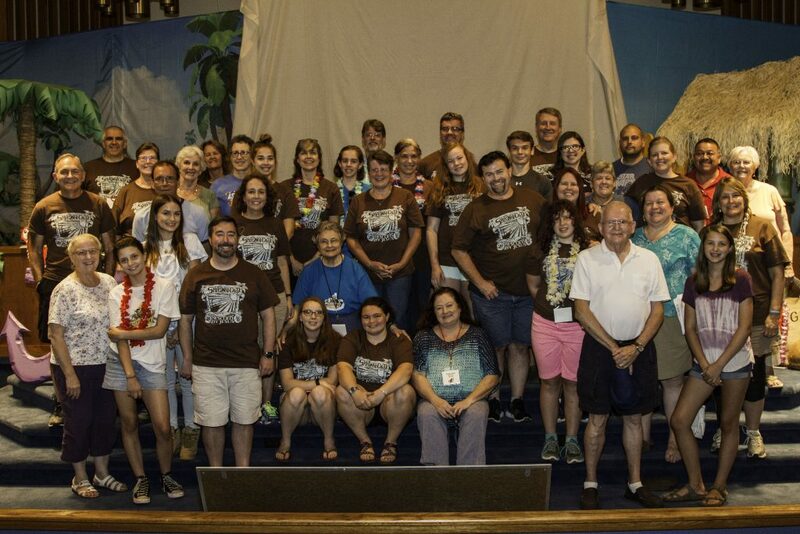 Thank you to all of the Shipwrecked Crew (not all pictured) for the all that you have done to make VBS2018 successful. All volunteers who will be working at Bible School are encouraged to attend this training session that will begin with an overview of a “day” at VBS. We will discuss the VBS schedule as well as other topics that pertain to all volunteers, and the large group meeting will conclude with a time of prayer. Afterwards, volunteers will meet with other members on their team (Kitchen, Security, Registration, etc.) as needed, while Crew Leaders will receive their Crew bags, supplies, rosters, and information booklets. If you have not attended a training session for Shipwrecked VBS, PLEASE make every effort to attend this one! *Make-up Training Session (for Crew Leaders only) who cannot attend the July 14 training is Sunday, July 15 at 2:30 pm in the Family Life Center. Pray for the health and safety of all volunteers and families. Pray that God’s love will be shown through our words and actions. Pray especially for Crew Leaders this week—that they would be effective in building relationships with the children; pray for wisdom, kindness, compassion, and laughter. 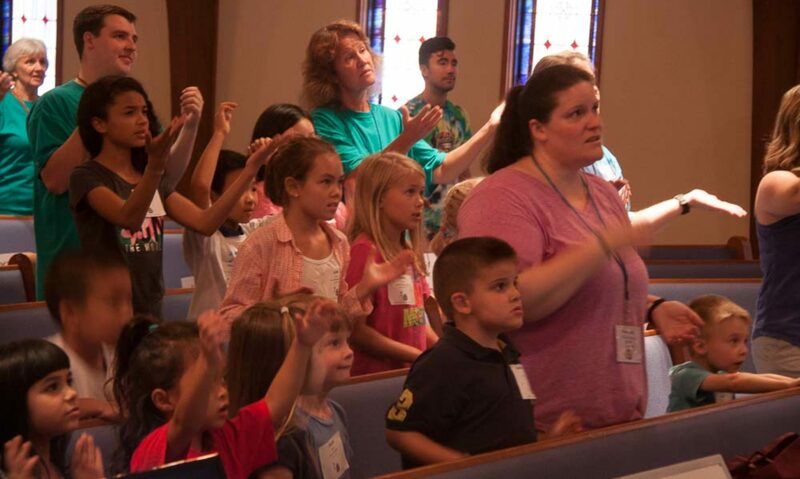 Continue to pray that God will prepare the hearts of our VBS participants and their families for the mes-sage of God’s grace and love, and that as a result, lives will be changed and Christ will be glorified! Sunday, July 15—When you’re lonely…Jesus rescues! -Pray that we will help children understand that Jesus rescues us by being our forever friend who loves and pursues us and that they will discover they are never alone because Jesus knows our hearts, under-stands our hurts, and is always holding us close. Monday, July 16— When you worry…Jesus rescues! -One study found that kids today are more worried than people who were hospitalized for anxiety in the 1950’s. Pray that we might teach children to cast their anxieties on Jesus and learn to replace worry with wonder as they watch Him care for their every need. Tuesday, July 17— When you struggle…Jesus rescues! -Pray that we will help kids realize that though they may face many struggles in their lives, they do not face them alone. Pray that we might help children realize that Jesus knows what it’s like to struggle and that we can rest in the promise of His constant care. Wednesday, July 18— When you do wrong…Jesus rescues! – Pray that we will effectively communicate Jesus’ love and forgiveness in order to help children under-stand their need for Jesus. Pray that we might guide children to discover that there is nothing they can do to make God love them less and nothing they can do that is beyond God’s forgiveness. Thursday, July 19— When you’re powerless…Jesus rescues! -Children (and adults) understand what it’s like to feel powerless in life’s storms. Pray that children and workers will be reminded that in our weakness, God’s strength can do powerful things and that because of Jesus, we can not only comfort others, but also uphold people in prayers to a mighty God. -Pray for the success of our closing production and Kid’s Mission Projects. at Hope Valley Baptist Church. At-the-door registration will open on Sunday, July 15 at 5:20pm in the HVBC Family Life Center. Additional Information about VBS can be found here. Contact Amy Herring, Minister of Children and Families. Venture onto an uncharted island where kids survive and thrive! Anchor kids in the Truth that Jesus carries them through life’s storms.